Using Transport rules, you can look for specific conditions in messages that pass through your organization and take action on them. Transport rules let you apply messaging policies to email messages, secure messages, protect messaging systems, and prevent information leakage. Transport rules are similar to the Inbox rules that are available in many email clients. 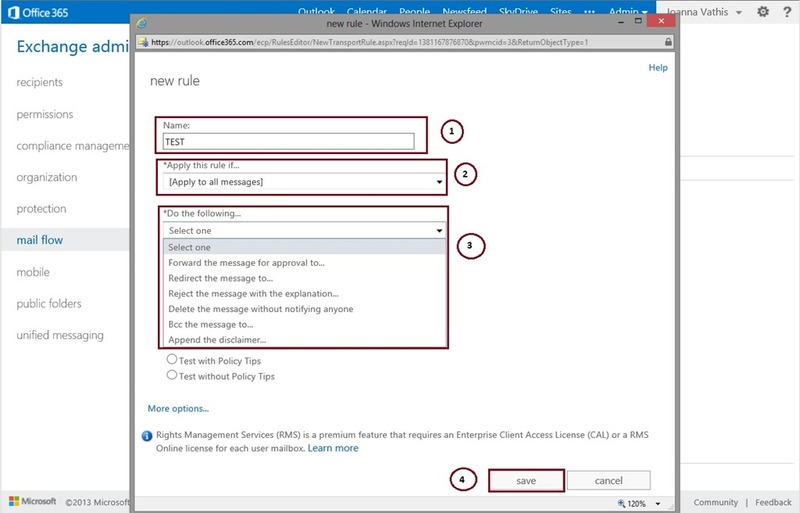 The main difference between Transport rules and rules you would set up in a client application such as Outlook is that Transport rules take action on messages while they’re in transit as opposed to after the message is delivered. Transport rules also contain a richer set of conditions, exceptions, and actions, which provides you with the flexibility to create a customized rule. You can create up to 100 Transport rules in order to implement your business-rule compliance. You create Transport rules to meet your business needs. As messages go through your organization, the Transport rules agent is invoked. The Transport rules agent is a special component that checks messages against the Transport rules you create. Conditions   Use Transport rule conditions to specify the characteristics of messages to which you want to apply a Transport rule action. Conditions consist of one or more predicates that specify the parts of a message that should be examined. Some predicates examine message fields or headers, such as the To, From, or Cc fields. Other predicates examine message characteristics such as message subject, body, attachments, message size, and message classification. Most predicates require that you specify a comparison operator, such as equals, doesn’t equal, or contains, and a value to match. Exceptions Exceptions are based on the same predicates used to build Transport rule conditions. However, unlike conditions, exceptions identify messages to which Transport rule actions shouldn’t be applied. Exceptions override conditions and prevent actions from being applied to an email message, even if the message matches all configured conditions. Actions Actions are applied to messages that match the conditions and don’t match any exceptions defined in the Transport rule. 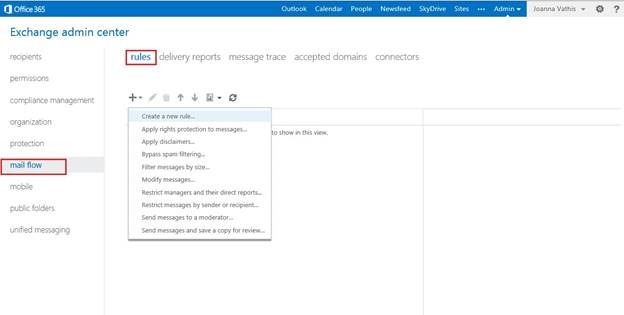 Transport rules have many actions available, such as rejecting, deleting, or redirecting messages, adding additional recipients, adding prefixes in the message subject, or inserting disclaimers in the message body. For a complete list of Transport rule predicates, see Transport Rule Predicates. The list of predicates is also available in the Transport rule dialog in the EAC. If you use the Shell, you can retrieve the list of predicates by using the Get-TransportRulePredicate cmdlet. For a complete list of Transport rule actions available, see Transport Rule Actions. The list of actions is also available in the Transport rule dialog box in the EAC. If you use the Shell, you can retrieve the list of actions by using the Get-TransportRuleAction cmdlet. 4. 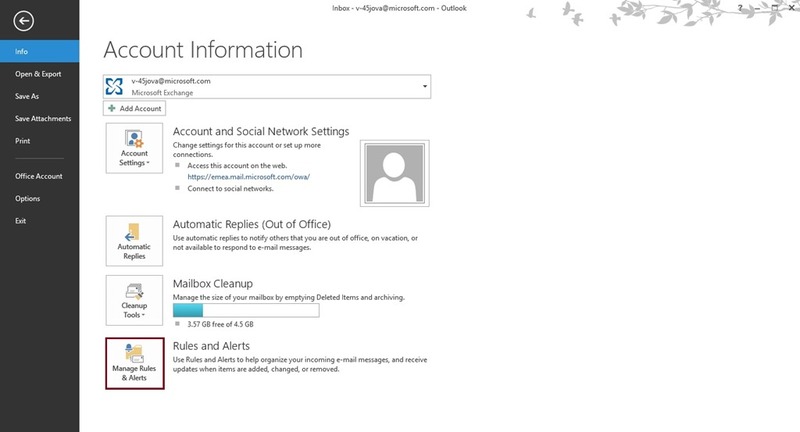 Now, this rule is ready to be applied to all emails coming through your Office 365 tenant. 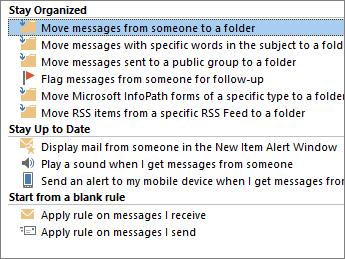 A rule is an action that Microsoft Outlook runs automatically on incoming or outgoing messages, based on conditions that you have specified. Rules help reduce manually filing or taking the same action when a similar message arrives. Unlike Quick Steps, rules typically are always on and run automatically. For example, when a message is received from a specified person, it’s automatically moved to the folder that you designate. 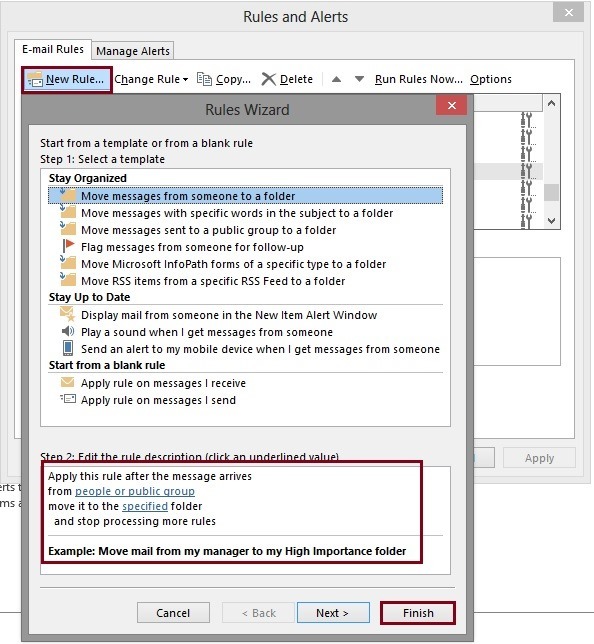 The Rules Wizard helps you design rules to manage messages. Rules fall into one of two categories — organization and notification. Stay Organized    These rules help you file and follow up on messages. For example, you can create a rule for messages from a specific sender, such as Anne Weiler, with the word “sales” in the Subject line, to be flagged for follow-up, categorized as Sales, and moved to a folder named Anne’s Sales. Stay Up to Date    These rules notify you in some way when you receive a particular message. For example, you can create a rule that automatically sends a message to a mobile device when you receive a message from a family member. Start from a blank rule    These are rules that you create without the aid of a rule template and that you can completely customize. 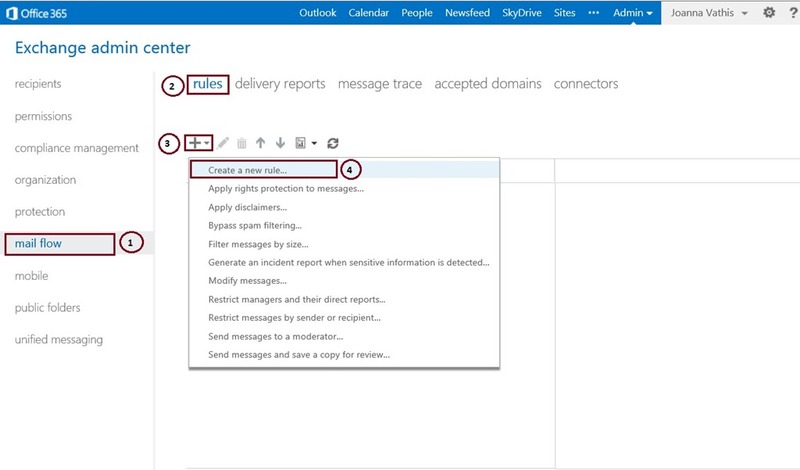 Outlook includes rule templates for common scenarios. Use these rule templates, or create design your own custom rules.